The super cute Ika musume strikes back again. As many may be aware, Ova rarely contain much of a plot so there is not much progression. Nevertheless, this OVA is hilarious, cute, and gives a new view for each characters ( not that much but ok ). Well there really isn't much story and your not going to get your "brainteaser of the day". If you want that, go to some detective site and try to solve the mystery ( I actually know people who do that ). Basically, if you watched and enjoyed the original series and aren't seeking to criticize every single possible point such as "Squid people don't look like Ika musume", "aliens don't use magic" and "MIT people dont say 'don't mind'"(who knows? they might:P). Alright, returning from my digression, as previously mentioned, watch for comedy, enjoyment, ebi and gesho purposes. If you haven't watched the preceding series, WATCH IT. But if you have and you enjoyed it (as you probably have, wandering here) WATCH THIS. All hail Ika musume! SHINRYAKU! oh and the songs sound really cute. just wanted to point that out. and seiyuus, great! Ok, degeso, It's time for me to make a review of this 1 off OVA of "Shinryaku! 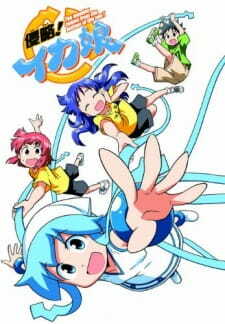 Ika Musume," degeso. So let's get down to business and no more BS, degeso, what we have here is more like an anime that should have been included in season 2 of its parent anime, since it is still compose of 3 omake intergated in one episode, degeso, and each one of it is either a hit or miss, but to me it all a hit in one's funny bone, degeso. So for the story, I'd give it a "Good" number 7, degeso, well, it ain't much but replacing the plot with your typical slap stick laughter suffices the direction of this OVA, degeso. Let's face it nothing has change about the way that everything was drawn, beside, I no art critic, degeso. I hate both the opening and ending themes, degeso. So far the characters being main or supporting has not lost their comedic touch, degeso, as usual, Ikachan has not conquered the surface world, degeso, Eiko and her siblings are still keeping her under control, degeso. The three MIT scientist.................I still can put my finger on them, degeso. Enjoyment and Overall: Good 7, degeso. Eventhough the season 2 was over and whether or not there will be a season 3, this OVA did delivered the laughs and surly this OVA's studio should consider making a season 3, degeso. Only if they knew that making another season would be worthwhile, degeso, but hey, overall, this rocks, degeso.